When an employee is injured on the job, the natural inclination is to blame the employer. However, when a worker is injured due to defective machinery or malfunctioning products, the manufacturer of the equipment is to blame. Although the injured party may be able to receive worker’s compensation for their injuries from the employer, the legal case will be against a third party, the manufacturer of the equipment, and not the employer. Ideally, equipment would work perfectly, but even new equipment or machinery can have defects that can result in injuries to the operator due to poor construction or manufacturer negligence. If a machine is not properly run or maintained it can malfunction and cause life-threatening injuries such as brain trauma, amputated limbs, spinal cord injuries, paralysis, and chemical burns. Injuries sustained from large machines, in particular, can be even more severe. These types of injuries can lead to long-term disabilities and, in worse cases, even death. With catastrophic injuries, there is also the possibility that even with recovery and medical treatment, the employee will never work again. In some cases, injuries suffered can be so severe that they require long stints of hospitalization and time lost from work. Sustained injuries can include daily, chronic pain, ongoing hospitalization or permanent disability or disfigurement. These long-term issues can lead to significant decrease in quality of life. Trying to seek restitution from injuries sustained due to defective products usually involves fighting for your rights against large corporations, which have had either a defect in the design or manufacturing of their products or even in the marketing of their products – when they fail to adequately include dangers or warning instructions with their products. As you probably know, fighting a large manufacturer (or any large corporation), is tough. You need an experienced legal team on your side to help recover benefits that are rightfully yours, such as compensation for medical bills, lost wages and pain and suffering. These types of cases can prove very complicated, and it can be difficult to prove that the machinery or equipment was, indeed, defective. It can also be tough to prove that the liability for your injuries lies with a negligent equipment manufacturer because in order to bring a product liability claim against the manufacturer of the defective equipment, you must prove a design defect, a manufacturing flaw, or failure to warn of known or likely dangers existed. These issues make it extremely complicated to build a legal case for the victim. Again, having an experienced lawyer on your side is crucial. In some cases, if the machinery became defective through normal use and the employer knew of the risks and danger, yet chose not to replace it, then there may be a legal case against the employer, and not the manufacturer. These instances make machinery work injuries that are due to malfunction or defects very complex from a legal standpoint. You also need to be aware that there are laws that protect the employer from being sued for defective equipment, so it is important to establish who is liable for the injury. Consulting with an experienced liability attorney is the first step to determining an employee’s unique situation An experienced work injury law team will thoroughly investigate the cause of the injury and pursue a legal case against the liable party. The Miami defective machinery attorneys at Friedman, Rodman and Frank will work closely with experts to determine the exact cause of your serious injuries. If the problem proves to be a defective machine, we will aggressively pursue maximum compensation for all injuries, costs and losses. 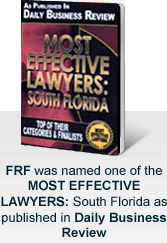 Contact our law firm online or call 305-448-8585 or toll free at 877-448-8585 to schedule a free initial consultation. We are available 24 hours a day.